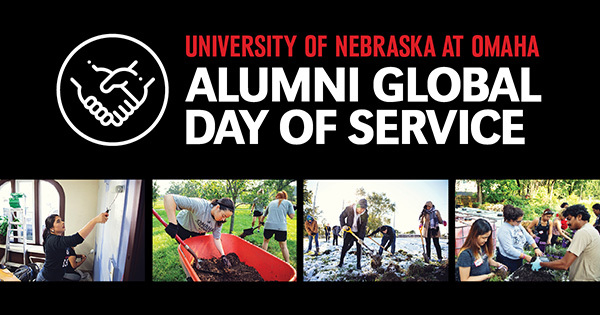 PLEASE JOIN US for a rewarding day of service at the second annual UNO Alumni Global Day of Service Saturday, March 23! Once again, we're partnering with UNO’s Office of Civic and Social Responsibility to offer alumni the opportunity to work alongside students, faculty and staff on community engagement and service projects in Omaha and wherever else there are Mavericks. Alumni Global Day of Service last year had national and global reach, with alumni serving in cities throughout the United States and even in Spain and Germany. To maximize our potential impact, between March 16-23 alumni are encouraged to pledge to participate at a distance in their own communities or to join us in Omaha. UNO will send shirts to all those who pledge to participate! Alumni who participate March 23 as part of our in-person service day in Omaha are encouraged to bring family and friends — this is a great opportunity for youth to get service hours! Participants will meet at UNO for breakfast then be transported to the project they sign up for. Dress to make a difference and prepare for a memorable and impactful experience. Lunch also will be provided. Alumni unable to join us in person on March 23 are encouraged to initiate their own service project between March 16-23 wherever they live. Consider picking up litter, helping at a shelter, serving youth, or anything else close to your heart. The resources below may help connect you to opportunities in your area. All alumni who share their service activity on social media using the hashtag #UNOServes and their location will be entered to win a prize pack of UNO gear!